52 Quilts in 52 Weeks: Sunday Stash and a Giveaway! Although I don't "do" the Black Friday sales, I do have some new additions to the fabric collection to share with you all today. My "12 Days of Christmas" purchase came from Craftsy. 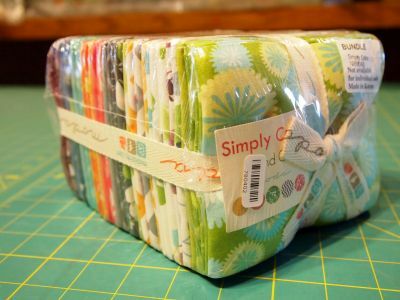 A bargain on the entire "Simply Color" collection from V and Co. Not assigned to a project yet, but keep reading for a possible use of this lovely set of fat quarters! I really need to keep the receipts when I order stuff online. I can't remember where I bought this fat quarter collection. 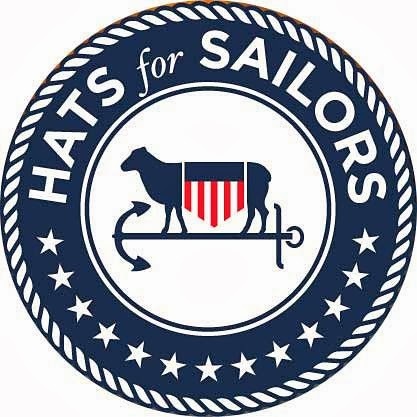 I do know I want to use it for a quilt for the next sailor on the USS George Washington to get promoted or earn the Navy Warfare Badge. 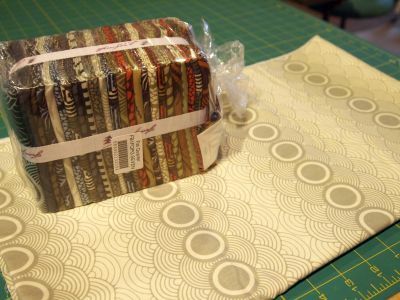 It's called "Seven Wonders" and it's the newest from Parson Grey for Free Spirit fabrics. The companion print is called "Clouds," and it just makes me think of My Little Sailor's photo of the Indian Ocean. We're making pillows with some of these fabrics. I can't wait to find out for whom I'm making a pillow, because I already have an idea for my design! Yes. Yes she did. And what, pray tell, would the giveaway be? 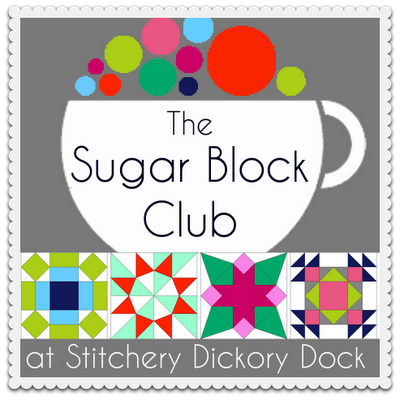 How about a membership to Amy Gibson's 2013 block of the month program, the Sugar Block Club? You may know that Amy was the designer for Crafsty's 2012 Block of the Month program. 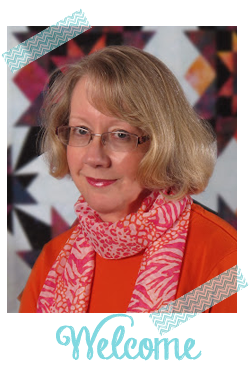 Probably the most successful BOM program in the history of quilting, it had thousands of participants worldwide! BTW -- that Simply Color FQ bundle? That's what I'm going to use for my own Sugar Block Club quilt! I am your follower and I love anything with HST. I followed the Craftsy block of the month and would love to follow next year's series! I love the Simply Color bundle! I'm a follower and I love churn dash! I love the chunky chevron block..I can't stop staring at it. I also follow your blog. I'm already a happy follower and my favorite quilt block is the log cabin. Thanks for the sweet giveaway! What a great giveaway! I am a follower. My favorite block is log cabin! I've just heard about the sugar block club this week, thank you for the giveaway! My favorite quilt block, well though I am just in the process of cutting out the pieces and haven't had to sew one together ;), the New York Beauty variations are my favorite at the moment! Wow, I'm not sure I have a favorite quilt block -- I always like the one I saw last. I'm fickle like that. But I like string quilts, and log cabin, and (to look at) flying geese. I am a follower. I'm a follower and I love to make string blocks! I like to admire very complicated blocks online. ;-D Thanks for your giveway~! I follow your blog! I think my favorite block is log cabin. I'm a follower and Sawtooth Stars are my favorite block. Thanks for the giveaway! Both of those fabric bundles are so pretty! I am a follower of your blog and I love any of the "star" blocks. There are so many and I love them all, hehe. I am a follower. It' s hard to pick a favorite block - it changes. Right now, I'd say an Eternity Knot or a Dresden Heart. I'm excited about this giveaway! I love Amy's blog. My favorite block would have to be a log cabin, or anything with HST- so easy and lots of fun combos. Thanks for the chance to win! Of course I am a follower (or is that devoted looker??) - perhps star blocks - though I like almost everything..
My favourite block is the granny squares at the moment. I've been inspired by them on so many blogs. I follow your blog and appreciate the chance to enter your giveaway! My favorite piecing is free piecing monochromatic blocks! I love anything wonky! I'm a follower and I that simply colour pack is amazing. At the moments I'm really enjoying granny squares and pinwheel block but my favourite block changes whenever I make a different block. I love log cabin blocks! They are so fun. I'm a follower. I like the log cabin block the best, though I really like most of them. I love Simply Color! I am your follower on Google Reader. Thanks for the chance to win this fabulous GA! I'm a follower through GFC/Google reader - I love Ohio Star blocks! My favorite block -- oooh that is a hard one. My first thought would be log cabin, but lately I've made more star blocks. I really like that Dresden heart block you showed. I'd like to do that for a baby quilt--right after we finish Easy Street. Thanks for a chance to win your great giveaway. I am already a follower of yours. I love the ever versatile log cabin. I am a follower with my google reader's subscribe button on my bookmarks bar-the second best button google came up with; the first being the Next button that just pops me onto the next subscribed-to blog. Not in the reader but the actual blog itself. Way better reading experiences. I'm a follower and my favorite block is the Swoon! 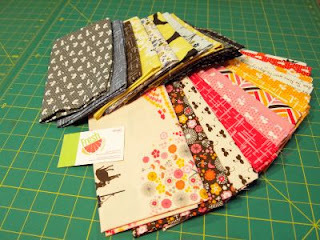 I've got a set of The Sweetest Thing that I think would be great for the Sugar Block Club! I follow you and love a wonky star or a churn dash. I follow you! I am a new quilter and am learning about the vast number of blocks out there! But I do love anything stars and aspire to do a Dresden plate some day! Thanks for the fiveaway! I didn't know your blog and it is great! I am a new follower. My favourite blocks are all kinds of paper pieced stars. I am a follower. I love a log cabin looking star I made. (I don't know the real name.) I am a follower. Woo Hoo!! Membership in Amy's Sugar Block Club would be stupendous! I am a follower via Google FC & Google Reader. I like lots of blocks but like the churn dash and also dresden plate. This is a great giveaway. One of my favorite blocks is Jacobs Ladder - it's only four patches and half square triangles and it is a quick block to make and can be made in any size without too much fuss or math. With just a little maneuvering you can change the block into countless others. Thanks for the opportunity. I am a follower. My favorite block is log cabin. Thanks for the chance to win! I am a new follower and my favourite block is flying geese! Thanks for the giveaway. I follow you, and my favorite block is the Schoolhouse. I think that whatever block I am working on is my favorite. Right now it's Moth In The Window, using men's recycled shirts, but I have three quilts in the lineup. One uses batiks, another uses bright spring colors and the other is a Quilt of Valor. Thanks for the giveaway. I love Contrary Wife. It's the block I used to make my first quilt, and tickles me every time I hear it. I follow you on my Google Reader! I'm a new follower that LOVES,LOVES,LOVES BOM's. My favorite block is any star! With "laundry day" the first block from Designers Mystery BOM running a close 2nd! I am a follower and love your block, Marti. I love too many blocks to really pick a fav. My fav seems to be the one I just saw on someone's blog that I simply MUST try! !